The Savage Sword of Conan Vol. 1 – 22 (2007-2016) : The Savage Sword of Conan was a black and white magazine sized comic anthology which was published by Marvel Comics imprint Curtis Magazines beginning in 1974. As a magazine it was exempt from the Comics Code Authority. This made it attractive to many creators and over it’s long publication run it attracted many now legendary comics creators. Savage Sword featured properties related to the writer Robert E. Howard such as Conan, Kull, Solomon Kane and the Roy Thomas/Robert E. Howard amalgamation Red Sonja keeping these characters fresh and introducing them to new generations of readers. It also showcased many of Howard’s lesser known characters and poetry. 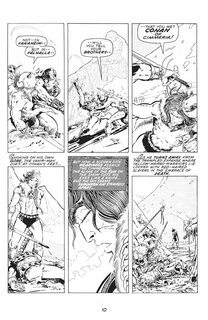 Savage Sword also featured the creations of some of it’s writers and artists such as Gil Kane’s Blackmark and John Buscema’s Bront. Also contained within it’s pages were articles on background elements of the Hyborian World, book reviews of Howard properties and fanzines, articles on Historical Reenactment Societies as well as what must be some of the earliest forms of cosplay complete with photos. Perhaps the greatest contribution of the Savage Sword of Conan was as a feature for artists both established and up-and-coming. Full page pin-ups were featured in nearly every issue and the cover art is truly amazing. A spin off magazine titled Conan the Savage ran for 10 issues and followed the same format. Also the series has been reprinted (in varying order) in the magazine Conan Saga. Savage Sword of Conan has recently been reprinted by Dark Horse Comics into nice digest sized collections. There has also been a reprint series of Savage Sword of Conan in the United Kingdom.